Sarah Ruhl’s charming new romantic comedy, Stage Kiss, is a hilarious yet refreshingly honest exploration of what happens when the lines between acting and real life become blurred. Using a unique blend of comedy and drama, Ruhl playfully exposes the plight of romantic leads turned real-life lovers. Rebecca Hurd (Maid), Grant Fletcher Prewitt (Kevin), Todd Gearhart (He) and Stacia Rice (She) in STAGE KISS. Photo by Joan Marcus. In the first half of Stage Kiss, Ruhl unearths and thoroughly prods every theatre stereotype that has ever existed—and then some. The delightful humor of act one plays to a general audience, but garners extra head nods and belly laughs from theatre insiders, who can’t help but reminisce about their own experiences behind the curtain. The lead characters of Stage Kiss are called “He,” and “She.” The intentionally vague labeling may be unusual, but provides plenty of interpretive wiggle room for the actors, and invites members of the audience to imagine themselves in the shoes of the characters. Stage Kiss is splendidly unique in its ability to make an audience feel like they are a part of a show. Scene changes conducted at the hands of a character—the witless director—are both clever and purposeful. The effect created by these scene changes elegantly parallels the plot. Fantasy and reality become blurred. The audience doesn’t just watch a show bleed into real life—they live it. Ruhl’s writing isn’t inherently hilarious, but is ripe with comic potential. It requires 100% commitment from actors to truly sparkle. The Guthrie’s cast was certainly up to the task. Grant Fletcher Prewitt’s performance as Kevin, a nerdy, over-eager understudy, was exceptionally uproarious. Act two of Stage Kiss crashes in with a surprising gust of slapstick comedy (complete with mockery of Roger and Hammerstein’s timeless, yet ridiculously sappy song, Some Enchanted Evening.) The tone remains light and whimsical even as the plot takes a more realistic turn. In the end, Ruhl’s leading lady abandons the ghost of a youthful, recklessly passionate romance in favor of a quiet love marked by commitment and consistency. The moral of the play borders on cliché, but is appropriately heartwarming and not entirely predictable. To every theatre-goer who has witnessed a passionate onstage kiss and wondered if it was real: Sarah Ruhl is here for you. 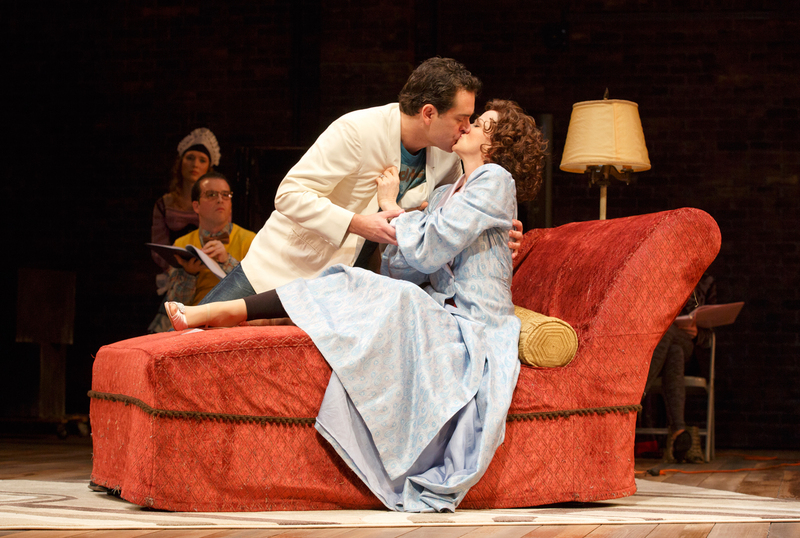 Make a date to see the Guthrie’s production of Stage Kiss before summer’s end! Stage Kiss, by Sarah Ruhl, runs July 18-August 30, 2015 on the McGuire Proscenium Stage at the Guthrie Theater, 818 2nd St S, Minneapolis. Tickets start at $40.00 at guthrietheater.org. Ellen Ferry, a recent graduate of Augustana College in Sioux Falls, SD, is passionate about singing, swing dancing and and theatre. She enjoys her day job as a member of the Human Resources team at Lifetouch.